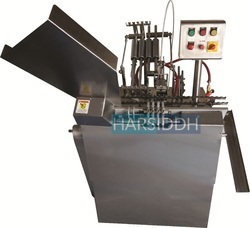 We at HARSIDDH STERILEPACK (INDIA) PVT LTD making Ampoule Filling Machine for all international standard make ampoules, our range of ampoule filling machine includes Single Head Ampoule Filling Machine, Two head Ampoule Filling Machine, Six Head Ampoule Filling Machine, Eight Head Ampoule Filling Machine, Automatic High speed Vertical Eight Head Ampoule Filling Machine, Single Head Closed Ampoule Filling Machine, Two Closed head Ampoule Filling Machine, Six Closed Head Ampoule Filling Machine, Eight Closed Head Ampoule Filling Machine, all our Ampoule Filling Machine compatible with ampoule standard of neck dimensions, in fact, our machines also gives very good result on any kind of ampoules as well which are challenged thicknesses and ovality wise. Our all Ampoule Filling Machine can fill and seal in united in just one machine for all injections ampoules. All our machines are made of superior quality SS materials in accord with the all cGMP norms. Power (W) 415 Volts,3 Phase with Neutral & Earthing (5 Wire system) 50 Hz. Power(KW) 415 Volts,3 Phase with Neutral And Earthing (5 Wire system) 50 Hz. Power Source 415 Volts,3 Phase with Neutral & Earthing (5 Wire system) 50 Hz. We are leading manufacturer and exporter of Ampoule Filling Machine and our product is made up of good quality. Our offered machines have intense uses in filling ampoules of various sizes with maximum precision at high-speed. These machines possess excellent productivity and robustness traits owing to their fabrication being done by using high-end technology. Apart from this, these are supplied to customers in varied configurations as per clients' precise requirements. Power Consumption (Kilowatt) 220 Volts,1 Phase with Neutral & Earthing 50 Hz. We are leading manufacturer and exporter of Ampoule Filler Sealer and our product is made up of good quality. We have different types of ampoule filling and sealing machine suitable for any types and sizes of glass ampoules. 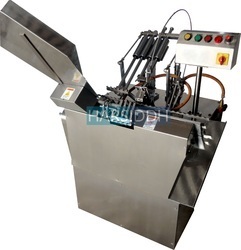 Our range of machines includes Single Head Ampoule Filler Sealer, Two Head Ampoule Filler Sealer, Four Head Ampoule Filler Sealer, Eight Head Ampoule Filler Sealer. We are leading manufacturer and exporter of Injectable Ampoule Filling Sealing Machine and our product is made up of good quality. 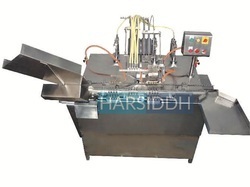 Harsiddh Engineering Co. is An ISO 9001: 2008 Certified and D&B registered company manufacturing all types Injectable Ampoule Filling Sealing Machine. We are leading manufacturer and exporter of Ampoule Sealing Machine and our product is made up of good quality. Mainly used in pharma, cosmetics and agriculture industry. Extremely variable speed to achieve optimum production. Simply replaceable change parts with minimum setting time to accept different sizes of Ampoules. Easy and prompt unloading from the moving rack. Instant and suitable access to controls. “No Ampoule No Filling” Function. Higher out put up to 17500 Ampoules per hour. Flow meters makes regulating flames easier. We are manufacturing and supplying Ampoule Injection Filling Machine. Our offered machines are extensively used in pharma industries for their high-performance efficiency and excellent finishing. Apart from this, we have with us wide preferences of these machines for supply to customers at competitive market rates. We have attained huge expertise in manufacturing and supplying Double Stroke Ampoule Filling Machine. Our offered machines utilize a double stroke mechanism for effective filling of ampoule with utmost precision. Due to these aspects, these machines have profound use in the pharma industry. Designed and fabricated by skilled experts with the use of high-end technology, these machines are available with us in wide stipulations. We make supply of these products top our customers at competitive market rates. No ampoule - No filling function”. We are leading manufacturer and exporter of Automatic Two Head Ampoule Filling Sealing Machine and our product is made up of good quality. 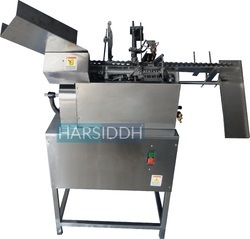 Harsiddh introducing a series of state of art technology Automatic Two Head Ampoule Filling & Sealing Machine, for performance and GMP demanding customers. 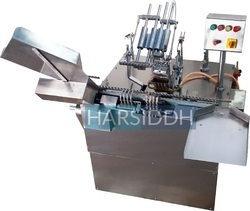 The machine built on the principle of Slant travel of ampoules while filling and sealing to take care of wide variation of ampoule neck dimensions, thicknesses, and ovality of available Indian ampoules. The unit built on S. S. Square pipe frame and totally encompassed with S. S. Coverings, in a pleasing matt finish, Further, the large opening available at the bottom side for ease of absolute cleaning. The sterilized ampoule tray can be directly loaded in to slant hopper of the unit. The Synchronized star wheel delivers ampoules, one by one on moving eccentric ampoule rack in single or two’s or four’s. During the stoppage of rack sequentially pre-gassing, filling, post gassing, preheating (for the single and double head only) and final sealing, annealing is achieved. At the end of the rack, optional synchronized pusher pushes out ampoules in to tray in vertical position. We are the leading supplier ofAseptic Filling Machinesmade available to our clients at competitive prices. 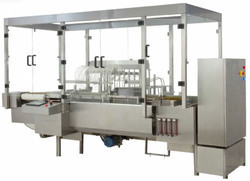 Our range of Aseptic Filling Machines is widely used in many pharmaceutical companies. One such useful equipment for the pharmaceutical industry is the Liquid Injection Filling Machine, helping professionals perform a gamut of ampoule filling and sealing tasks. We at Harsiddh Engineering Co offer a complete inventory of liquid filling machines with 1, 2, and 4, 6 and even 8-heads. Our exclusive range of liquid filling machines possesses ISO 9001:2000 certifications and thus offers superior functionality. All our liquid filling and sealing machines are cGMP models containing a vibration free structure. The manufacturing material of the contact parts is AISI 316 material, and the non-contact parts are manufactured from AISI 304 stainless steel, brass and mild steel.